Jakob Ludwig Felix M endelssohn-Bartholdy (1809 -1847) was a pianist, composer, conductor and teacher. Born to an affluent German family, Mendelssohn’s parents, Abraham and Lea Salomon, were responsible for much of his early education. Showing prodigious musical talent at an early age, Mendelsohn eventually began taking lessons with admired pianist Ludwig Berger in 1815 and composition classes with Carl Friedrich Zelter in 1819. At just eleven years old he composed his first composition, Recitativo. 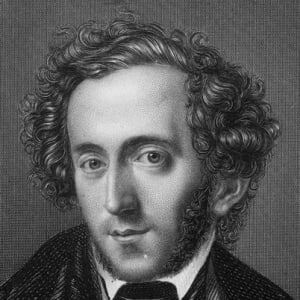 After many years of traveling, conducting and composing, Mendelssohn was accepted to the University of Berlin in 1827 and three years later was offered the position of the chair of music. While declining the offer, he continued to travel across Germany, England, Switzerland, and Scotland, producing and conducting numerous musical works. At age twenty eight, he married Cécile Jeanrenau, and in 1843 founded the conservatory of music at Leipzig. He died just four years later following the death of his sister, Fanny. As a 19th century musician in the early Romantic period, his works encompass the expressive artistry that was characteristic of the time while also maintaining the harmonic traditions of more classical composers such as Bach and Mozart. Elijah is one such piece, modeled after the oratorios of Handel and Bach but containing elements that clearly reflect the romanticism of the period. The work was written in both German and English, and first appeared in the latter at the Birmingham Town Hall on August 26th, 1846. Based on excerpts from the Old Testament, the musician gives a dramatic characterization of the biblical prophet Elijah. The piece follows Elijah’s interactions with Ahab, king of Israel, and his people. After taking Jezebel as his Queen, Ahab angers God by worshiping Baal, a god from Jezebel’s religion. Elijah helps the people of Israel pray to God to lift a drought he has administered as punishment. While successful, Ahab and Jezebel continue to worship Baal and convince the people of Israel to kill Elijah. As a result, Elijah seeks God’s guidance as he flees to the desert. Without narration, the oratorio presents a dramatic rendition of this story encompassing emotions of fear, sorrow, devotion, glory and malice.